This weekend I found myself driving to Canberra with Madam Macchiato to visit the beautiful (but deadly) Kommandant Kale, who has left Melbourne to answer the noble call of public service. Initially, while I was very happy for my dear friend, I not-so-secretly thought that she was in for a boring and depressing year in our nation’s capital. This was based on nothing but the general disdain that Melbournians tend to have for anywhere more than 15km out from the CBD (unless we are talking about “the beach”, which we just loooove with a self-righteous air of ownership). My view changed on Saturday morning, however, as seeing the capital for the first time in the light (the drive was awfully long – we arrived in the dark) I realised that it is a gorgeous garden city! With the impending upheaval of Royal Park to make way for the East-West link, this was a revelation as I have now found a city that is a essentially giant park with buildings scattered amongst it all to escape to. I could live in Canberra! Whew, I said it. We chose The Elk and Pea on the safely-named Lonsdale Street in somewhere called Braddon for our first venture – which was, I’m ashamed to say, a brunch. The intermediary meal of brunch throws me off-kilter for the day, punishment for waking up after 9am I suppose. We arrived and were shocked to be asked if we had a booking. Booking for brunch? What did they think they were, the Langham Hotel? The wait staff apologetically asked us to share a table with others outside, which was an unnecessary sentiment as there was an abundance of space on said table – if this was Melbourne there would have been four tables crammed into the space allocated for this one. Refreshing. In terms of decor, I can only comment on the table cloth, which made me quite happy as it carried a cheery sunflower pattern. Otherwise, it was nice to have a quiet, unhurried meal in the middle of a capital city. The pear is arranged like Parliament! Sort of – they probably realised that they couldn’t get away with only having four slices of pear as a garnish. And by probably realised, I mean that I have concocted that story about this muesli with a tourist’s excitement. The first mouthful of this dish revealed a deliciously tart puree that tasted more like passionfruit than pear, but I’m not picky as it was excellent. The cinnamon was generously present here, complimenting the stately, crisp pear perfectly and giving the plump, moist oats a comfort kick. 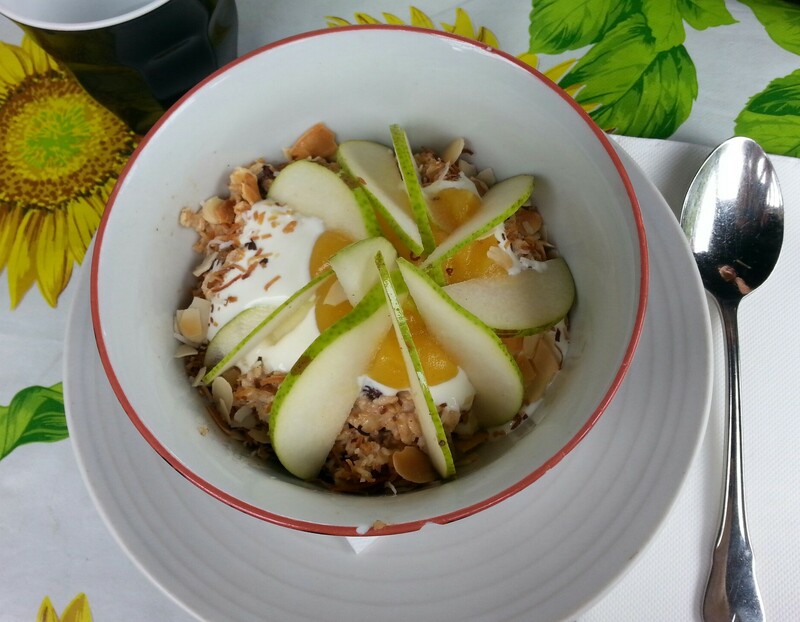 The crunchy toasted almonds and coconut contrasted nicely with the oats and chewy sultanas strewn throughout this dish. This is a powerful breakfast, one that could win elections, pass bills and do other confident political acts. Basically, I enjoyed this muesli so much that I would let it brainwash me – how dangerously alluring and absurd! Final word: The Elk and Pea have defied all expectations and delivered one of the best muesli that I have eaten so far. For those that live in Canberra, make a booking (weird) and demand this dish. For those in Melbourne, don’t drive up to Canberra, fly, then brave your disdain for all places ‘other’ and just order the muesli.